New customers can register on the storefront or on the checkout page. But you can also add a customer from the back office and you can do it! To create a new customer just give some basic info and an email with instructions will be sent to the customer to complete the registration. If you already have a customer database and want to upload this system. You can easily upload your customer data by CSV upload. 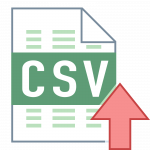 You’ll find the instructions and templates on the csv upload page.